For three days amid rain, wind and clouds, I joined hundreds of other lavender lovers at the PA Lavender Festival, Willow Pond Farm near Gettysburg. I was appearing in a huge dried flower hat with my Lavender book, and was fortunate to be placed under a small tent between the ice cream stand and the lunch line. No wonder I sold out of books! 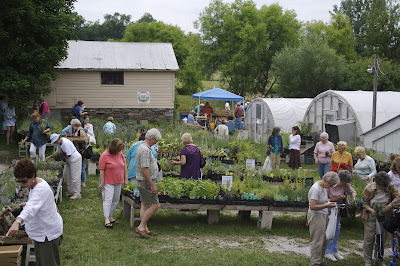 Visitors picked their own bunches, learned to weave lavender wands, attended lectures and demos, licked Bruster’s dark chocolate lavender cones, selected varieties to take home. •The charming Lavandula stoechas above, sometimes called Spanish, French or Italian lavender, is hardy only in Zones 8-9. In the NY area, treat it as an annual and you wont be disappointed. •When your lavender finishes its bloom, cut off spent stems down to the first cluster of leaves to encourage re-bloom later in the season. On the way home from the festival we stopped to see dear friends near my old Meadowlark Flower & Herb Farm. Their garden (above) had burst into lavender bloom, with L. x intermedia ‘Provence’ and ‘Grosso’ still in bud. Creeping thyme (Thymus serpyllum), which I had once helped to plant, had totally filled in the bluestone path. My parting gift to our hosts was a couple of hours of weeding in their daylily patch, as much a gift to me as to Gary & Diane. 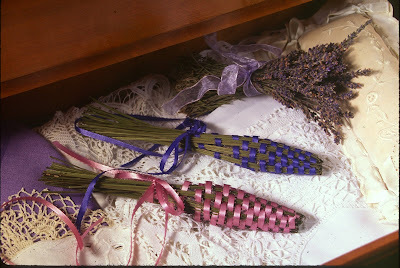 Even if you don't grow your own Lavandula angustifolia, you can buy a pack of culinary lavender buds to make these and other treats. These miniature shell-shaped cakes are typically French; rich and delicious they’re perfect for a tea party or afternoon treat. The only requirement is a Madeleine pan, available from most any cookware source. If buying a new one I strongly suggest that you look for the non-stick variety so the little dears will just pop out when you invert the pan. Lavender adds a delectable flavor here, as it does to most any simple cake or cookie recipe. Dunk the dainty Madeleine in a cup of tea to release the perfect combination of flavors. Don’t use a mixer for this recipe, beating by hand results in a lighter, more tender Madeleine. Butter and flour the Madeleine mold. Melt the butter, add the lavender and set aside to cool. Finely grate the lemon, yellow part only. In a medium bowl, wisk the eggs and salt until frothy. Add the sugar gradually, wisking as you go. With a rubber spatula or wooden spoon fold in the flour. Mix in the melted butter with lavender. Fill shells 2/3 full with batter. Bake on middle rack for 12 to fifteen minutes until firm and brown around the edges. Turn out immediately on a cooling rack, then sprinkle with confectioners sugar. Makes 24 cakes. When reusing the mold for the second dozen, butter and flour again.